We are excited to announce that we are now accepting applications for our 2017 Free Summer Two Week Intensive Leadership and Debate Training Program! We are currently recruiting Middle school, High School and College-aged young women and girls who wish to the gain necessary leadership and debate skills to excel in academic and extracurricular activities. Encourages young women and girls to take leadership roles in their local and global communities. Fosters awareness of social issues on a local, national and international level. Encourages spiritual and intellectual growth through various workshops and activities. Provides participants with opportunists to network with women in a multitude of fields, exposing them to opportunities for internships and employment. Utilizes debate training activities to enhance research and oral communication skills. Establishes mentoring relationships, support, and referrals for internships. Promotes the development of sisterhood through interactive and collaborative activities. If you or someone you know is interested in this opportunity, please apply online. Training Dates: Monday- Saturday, July 17th, 2017 to July 29th, 2017. In order to keep updated on BALI Events and opportunities, please visit our website and like our Facebook page. Grab your friends and take over the Met for the night. Drop in for teen-only activities across the Museum including art making, performances, gallery activities for teens by teens, music, dancing, and more. Discover what you can also do at over forty NYC cultural and community organizations this year. Doors will open at 5:00 p.m. 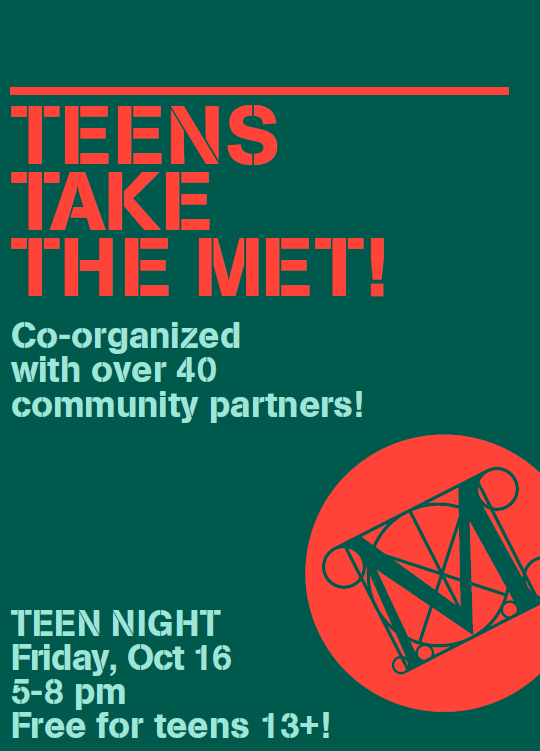 Teens Take the Met! is free and open to all teens 13-18 with a middle or high school ID. No RSVP—just show up! This event will be photographed, filmed, and/or recorded. By your presence at the event, you consent to the photography, filming and use of your image and/or voice. The Central Brooklyn Martin Luther King Commission is pleased to announce our 31st Annual “Education – Key To The Future” essay, poetry, and art contest for students in grades 4-12 in addition to a new Original Oratory Contest (for 11th grade students only). Topics for essays, poems, art & speech contestants details can be found on our website: www.cbmlkcommission.org. Middle School Winners – Prizes: $250 1st, $200 2nd, $75 for 3rd place High School Winners Prizes; $500 1st, $350 2nd, and $100 for 3rd. All entries will receive a T-shirt. Contest entries must be received online, on or before November 2, 2015. For information, please visit www.cbmlkcommission.org, send an email to cbmlkcommission@gmail.com or call the Commission at (347) 599-2061. Participants and guests will have a chance to win raffle prizes, like new computers. Each student and guest will receive a gift.